name 5 things. : Amen, Nordstrom. CNN was on in the background as I got ready for work the other morning (as it is every day), and I heard a story that resonated with me. 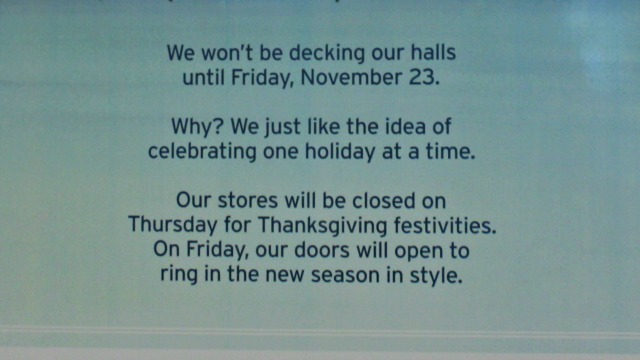 Nordstrom doesn't put up Christmas decorations until after Thanksgiving so they can celebrate one holiday at a time. I've got to say, I'm totally in favor of that mentality. I purposefully avoided the Christmas aisles at Target last weekend because I just wasn't ready for it quite yet. It probably has a lot to do with the fact that I'm always behind on holiday decorating/planning anyway, and the thought of planning for Christmas before Thanksgiving stresses me out. But I am also a proponent of taking the time to be thankful during Thanksgiving and enjoying that holiday before focusing on Christmas. Even after turkey-day is over, we still have a month to get in the Christmas-spirit (which I love too)! Evidently, this isn't anything new for Nordstrom. I guess I've just never paid attention before. So what do you think? Do you agree with Nordstrom or do you think Christmas can never come too early? This may be a dangerous crowd to ask -- I always feel like bloggers on totally on the ball when it comes to the holidays! But I want to know anyway. Just one more reason to be thankful for Nordstrom! :) I'm completely behind this too. Happy Thanksgiving to you Emily- I know you're thankful for your new home! This is fantastic! I hadn't noticed before, but now that you say it, I suppose I haven't noticed any Christmas decor. It's so nice to be able to enjoy Thanksgiving, and it always seems a bit weird to be carving the turkey with a Christmas tree in the background. Another reason to love Nordstrom! ditto! I just took down our Halloween decorations. I definitely support Nordstrom and the mentality behind it but in reality, if you want projects to be ready to go right after Thanksgiving you have to start early. There just needs to be a balance to ensure Tgiving isn't left in the dust. I for one won't watch Christmas movies or listen to Christmas carols until after Turkey day. Basically, it's not bad to plan ahead, just don't let it overtake the other important days in between. Totally agree!!! Stores were bringing out stuff months ago. I am not one of those "bloggers on the ball". In fact, with the renovations going on in my house, I'll be lucky to get a tree up this year. Anyway, I love that Nordstrom is taking a stand. Let's all relax a little, take some of the pressure off, and enjoy each holiday as they come. I was just thinking around your Thanksgiving, how happy I am that Canadian thanksgiving is in October - loads of time to prep for "fall" decor for thanksgiving and Halloween, and then shift into the holidays :) Hope you had a great TThanksgiving!